Home » Beach Villa 707 SOLD! 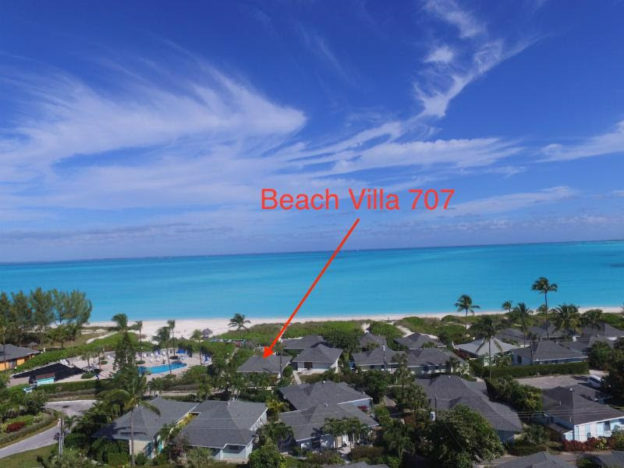 LOCATION, LOCATION, LOCATION… Beach Villa 707 is only 25 steps away from the award-winning pristine, powder white sands of the world famous Treasure Cay Beach and the stunning turquoise waters of the Sea of Abaco! The charming two bedroom, two bath furnished villa is located within the desirable Beach Villa community and steps away from the spectacular onsite heated villa pool, over-sized patio and private observation deck, along with the beckoning sand and surf beyond. Comfortable island living space is found in this 760 square foot home with an open living concept. Visualize stepping outside to dine privately under the stars as you listen to the gentle sounds of the nearby surf and feel the soothing breezes. Capture the essence of island living at Villa 707 with its close proximity to the beach and all the amenities of the villa complex, including a community washer and dryer facility and well maintained lush tropical landscaping. It is the perfect choice for a family vacation getaway, full time residence, or investment rental property. Live where dreams meet reality!